Insulin is critical for the regulation of glucose homeostasis whose dysfunction leads to excessive triglyceride accumulation in the liver, the hallmark of nonalcoholic fatty liver disease (NAFLD) pathology. However, the mechanisms of how insulin signals are transduced into the cell, and then regulate lipogenesis remains unknown. In a study published in Hepatology, Prof. LI Yu's team at Shanghai Institute of Nutrition and Health of Chinese Academy of Sciences (CAS) demonstrated a novel activating transcription factor/cAMP responsive element binding (ATF/CREB) family transcription cofactor, called CREB/ATF bZIP transcription factor (CREBZF), which senses insulin signaling and stimulates expression of lipogenic genes. This study was based on the previously reported AMP-activated protein kinase (AMPK)-mediated phosphorylation of sterol regulatory element binding protein (SREBP) in the regulation of hepatic lipogenesis. Scientists characterized CREBZF as a key lipogenic activator for hepatic fatty acid synthesis. Through in vivo and in vitro studies, CREBZF activity was revealed to be elevated in obesity and nutrient overload, which promotes lipogenesis and hepatic steatosis via Insig. 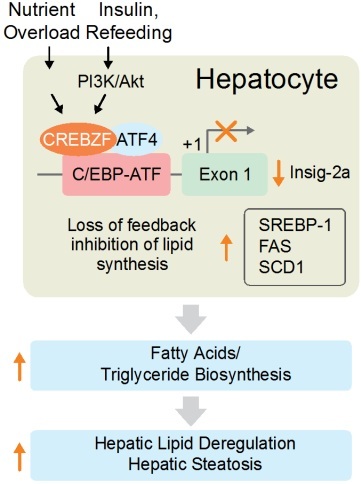 During refeeding, insulin-induced activation of CREBZF was found to inhibit Insig-2a expression in hepatocytes, allowing SREBP-1 to be processed and the activation of fatty acid synthesis. Moreover, the CREBZF/ATF4 heterodimer was found to serve as the direct regulator transducing excessive nutrient and hormonal signaling to the transcriptional regulation of Insig-2a. Hyperactivation of CREBZF may underscore the potential role of CREBZF in the development of sustained lipogenesis in the liver under selective insulin resistance conditions. 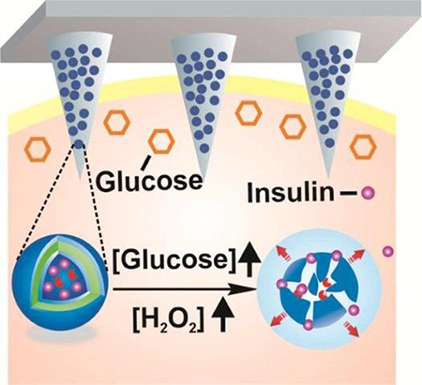 They demonstrated that CREBZF-dependent inhibition of insulin induced gene (Insig) represent a molecular mechanism by which extracellular hormonal cues are transduced into the cell, and then regulate Insig-mediated feedback regulation of lipogenesis, which may contribute to hepatic steatosis, dyslipidemia and insulin resistance. These findings conceptually advanced the understanding of the hormonal regulation of hepatic lipogenesis via the novel ATF/CREB family transcription factor. Also, they have therapeutic implications for hepatic steatosis, hyperlipidemia and insulin resistance. This study was funded by the grants from Ministry of Science and Technology of China (MOST), National Natural Science Foundation of China (NSFC) and Chinese Academy of Sciences.